Ref. / 90-02-43-32-05 / - with stainless steel and dial in gray ruthenium. The brand’s designers for these mechanical watches are developed a cylindrical case with a slightly larger size, which was designed in the walls of the company. Increased case in conjunction with a thin bezel opens up opportunities for new, most modern solutions. The watches of the Pano collection are characterized by asymmetrical layout of the dial. This distinctive feature was retained in their updated design that is tailored to the different models of the line. Located on the dial, shifted from the center components differ with simplicity and special refinement. On the left side of the dial at the top is an additional dial of hours and minutes indication. Underneath is a second dial with small second hand. On the right side at the 2 o’clock position is an indicator of moon phases, and at the 4 o’clock position - a large aperture of date. Note that this arrangement corresponds to the details of the "divine proportions", known as the "golden section", i.e. the law of the legendary aesthetic harmony, which for centuries governed by outstanding artists, musicians, architects. 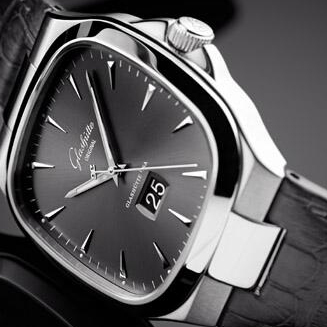 In 2012 the designers of Glashütte Original presents the new models in the new version. The strongest impression is made by the watch in case of red gold and silver dial with warm colors, on which look great the hour markers and hour, minute and second hands in pink gold. Unique indicator of the Moon phases is made of gold, images of stars and satellites of the Earth on a background of dark blue night sky. Two other variants of models PanoMaticLunar have a case of polished and satin stainless steel. The one of the model’s dial is made of silver, on which are clearly visible silver hour markers, harmoniously combined with the blued hour, minute and second hands. A large aperture of the date and moon phase indicator that represents the images of stars and satellites of the Earth on a background of the dark blue night sky, complete the picture. The second version is a watch from stainless steel with a dial from gray ruthenium, as well as hour, minute and additional second hands in white gold. This model is also saved the design of the date aperture, and pointer of the moon phases is made of silver images of stars and the moon on a background of silvery night sky. The dials are protected by a double-sided anti-reflective sapphire crystal. The case back transparent allows you to enjoy the work of the manufacturing movement 90-02 in diameter of 32.6 mm and a thickness of 7 mm. Sapphire allows you to monitor the work of exquisitely decorated elements, such as a traditional three-quarter plate with strip pattern, the off-center skeletonized rotor of 21-karat gold, blued screws, hammer, hand-engraved balance and dual control "swan neck". The caliber is assembled on the 47 jewels, equipped with a frequency of 28,800 vibrations per hour, power reserve of 42 hours, the functions of hours, minutes, seconds, date display and moon phases. New models PanoMaticLunar are offered with a leather Louisiana alligator strap; color and strap trimming may vary depending on the model. To buy the PanoMaticLunar watches with cases from stainless steel will be available also on steel bracelets. Official website of Glashutte Original watches.